The spookiest time of year is here! Leaves are falling, the days are getting shorter…it’s fall, and fall means Halloween! 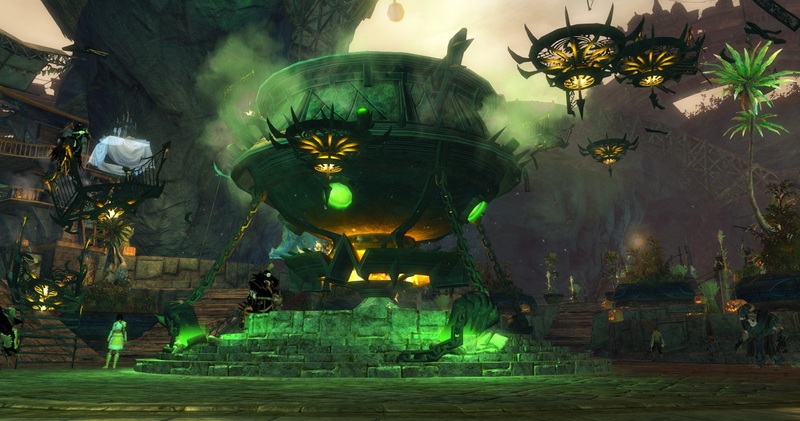 Holiday celebrations were always very popular and well-loved in the first Guild Wars, so it was no surprise that Halloween, being the first one seen in Guild Wars 2, had a lot of excited anticipation leading up to it. What new events would we be getting? Would old favorites like Costume Brawl be returning? And was the ever-witty Mad King Thorn going to make a reapparance? For that matter, would Mad King Says be coming back, and if so, how would that work with the limited emote pool currently in the game? Well, on Monday evening the first Act for Halloween 2012 was released, and already we’ve gotten a good taste of what will be going on over the next week. First and foremost were two big things; first that the Halloween events would be rolled out in a series of four Acts, culminating with Halloween night itself, and second being that there were a number of other new updates added that are permanent additions to the game – not all of the new things added will disappear as Halloween ends! The first thing you will notice upon entering Lion’s Arch is that it’s been decorated for the holiday. Pumpkins and candles everywhere, trick or treating children and quaggan tads (my favorite – the baby quaggan ghostie. Eeee! So adorable), and of course…the Mystic Forge looks a little different right now. A bit spookier, you could say. The Forge can still be used as normal, but the giant cauldron will have a special use…but what’s with all this madness going on around it? Witches melting and creating cauldrons, food fights going on at banquet tables, mummies and spiders and golems and raptors brawling with each other, as well as nonstop jokes…good luck, my friend, you’ve just walked into Costume Brawl. Or rather, a bunch of people costume brawling. 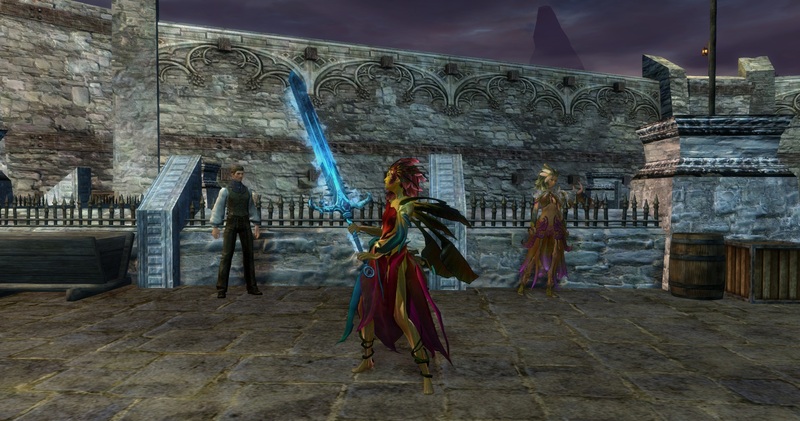 Now, in Guild Wars 1, Costume Brawl was an instanced PvP format where, depending on your profession, you’d take on the appearance of a specific character and have a set skill bar. 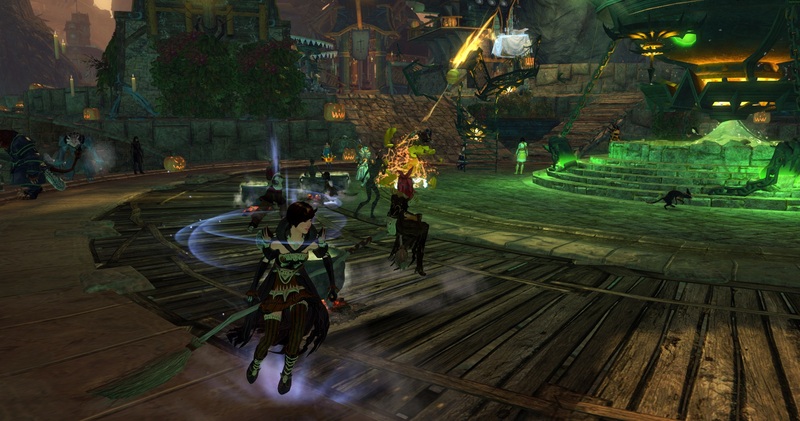 Things in Guild Wars 2 are…a bit different. More chaotic. And as someone who never liked PvP…far more enjoyable. Joining in Costume Brawl in GW2 is easy. Pop a tonic, climb up and jump into the cauldron, or don a costume, and join in the fun! You get special Costume Brawl skills to “fight” against others with; get 25 points before being taken out yourself and you’re the costume brawl champion! The best part about this is that a costume brawl can break out wherever there are players – we started doing it last night while in Orr! There are even more new things to discover in Lion’s Arch – there are new vendors, selling weapons skins (temporary, sadly; permanent ones can be crafted in the Mystic Forge but according to a friend of mine that was looking into that, they’re about equivalent to a legendary weapon), as well as new Artificer and Cooking recipes. There are also pumpkins that you can carve scattered around the city. 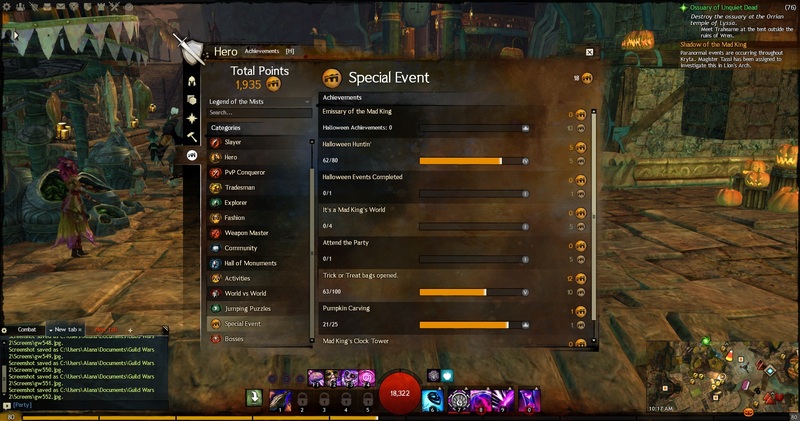 And if you talk to Tassi just south of the fountain in Lion’s Arch, you can get a candy corn-powered scanner which leads you on a scavenger hunt to find clues about the life of Mad King Thorn. I must say, I did the first leg of the scavenger hunt and did not enjoy it too much; the scanner seemed to be completely random as to whether or not it was actually using my candy corn to work, and I had issues in both having to be extremely precise in where I was scanning to get something to show up (was less than a foot away from where something should have spawned and it wouldn’t appear for me, but someone else was one step over and it appeared when he scanned), as well as NPCs despawning after I triggered them and before I could get to them. Still, the info you learn about Mad King Thorn by doing these is pretty neat, so even though I swore I would not continue on the hunt…I probably will after all. Now, I mentioned that the scanner is powered by candy corn. How do you get this candy corn? Well, if you go out into the world, you’ll notice a couple new things pretty quickly. The first is Raw Candy Corn nodes scattered around…and also, on occasion, you may see a door pop up that you can trick or treat at. Candy Corn nodes appear all over the world and can be mined just as any ore node can, and yes, there are even Rich Candy Corn nodes. 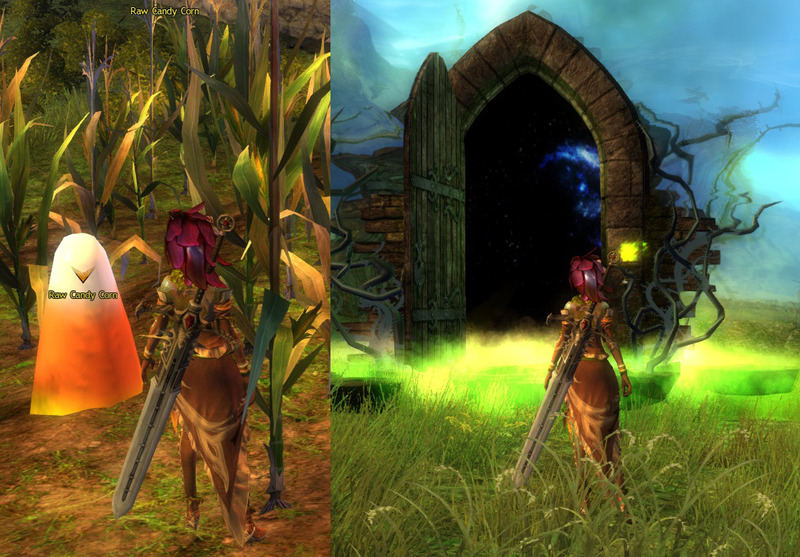 The doors so far I’ve only seen in Gendarran Fields and Queensdale; my assumption is that they only appear in Krytan zones. When you trick or treat at the door, one of two things will happen; you’ll get a trick or treat bag on the ground you can pick up, or Halloween monsters will spawn from it (plastic spiders and glow in the dark skeletons!) and you have to defeat them to close the door. Trick or treat bags are another source of candy corn, and you can get them a few other ways than just going up to doors – they can be received at random as drops from all enemies, as well as when you mine candy corn nodes (much like how you can randomly get jewels from regular ore nodes). Oooh, Candy Corn! Oooh, a door! You’ll want to collect candy corn and trick or treat bags for a few reasons. First of all, trick or treat bags give you more candy corn, as well as other special crafting materials! Oooh. Second, there are achievements for opening bags and chowing down on candy corn – just don’t eat too much too fast or your character will get sick (a hilariously gross little addition there). Third, those Artificer and Cooking recipes I mentioned up above? They use these items! So chances are it’s worth your while to collect these items – luckily, they aren’t difficult to farm. Candy Corn nodes are all over the place, and I’ve found that enemies drop bags at a pretty decent rate. And yes, there are new Halloween-related achievements – a new category called Special Events entirely where most of them can be found (except for Candy Corn Consumption – part of the Monthly Achievements, and Costume Brawl, which is under Community). There are a number of new ones available – including a new jumping puzzle, Mad King’s Clock Tower, that’s just for this event. Interesting! And on top of all this Halloween madness…there’s even more new stuff! There’ve been new dynamic events and jumping puzzles added, there are new mini-dungeons, and my favorite new addition – you get karma as part of the award for doing monthly and daily achievements, as well as for dungeon completion. Awesome! So, everyone, go out there and enjoy the new additions to the game! 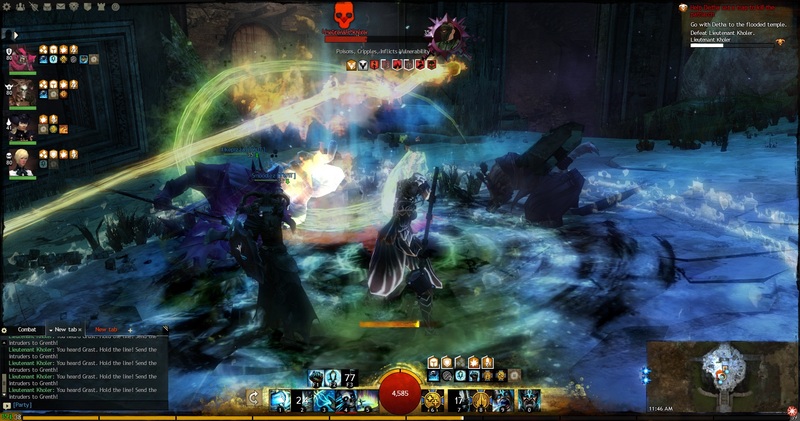 Dungeons are one of those aspects of Guild Wars 2 that I didn’t expect that I’d really ever do much of, primarily because I didn’t think I’d ever really have a group of people to regularly play with and I’m not a fan of PUGs, that I’ve found that I actually do a lot of. Especially now that I’ve been level 80 for some time. Not that I’ve done too many dungeons so far, really. As of right now I’ve done Ascalonian Catacombs, Caudecus’s Manor, Twilight Arbor, and Citadel of Flames all in Story Mode, and I’ve done one path each of Explorable for AC and CM. We attempted Sorrow’s Embrace story, but the fire golem boss stopped us dead. One issue I’ve run into, which is why so far I’ve only done Path 2 on AC, is that they can be buggy. Path 1 and 3 for AC, for example, are difficult because of the fact that objects have incredibly buggy hitboxes. If you’re in melee range, you can be hitting something at one moment only to get messages of “obstructed” “miss” the next. Ranged attacks have similar issues. AoE works…so long as you don’t have tons of enemies spawning from said object (I’m looking at you, graveling burrows) that trigger the cap on the number of things an AoE can hit before the actual object’s been damaged at all. I mentioned that we tried Sorrow’s Embrace, but we didn’t get further than the fire golem. The issue here is that the fire golem boss does very quick projectile attacks, deals tons of condition damage…and any conditions you inflict on it turn to healing. Now, the game all but encourages using conditions to deal damage. So many attacks – including auto-attacks – inflict conditions as well as damage. And considering our group was a mesmer, a necromancer, a thief, an elementalist, and a guardian…there were many, many conditions flying around. We tried to pull back and change our traits to be less conditiony, but there’s really only so much you can do with that without completely respeccing. Combined with the fact that that dungeon is pretty long…it was a bit frustrating, to say the least. I also somewhat find myself questioning the level requirement for many of the dungeons. For example, the other day my guardian reached level 35 and I went and did a run of AC path 2 with some fellow guild members. Now, I know AC path 2 very well. I’ve done it nearly 10 times now. And that? Was hard. It didn’t help that the cave troll spawned, but even without that, it was far more difficult. I can’t imagine how hard the dungeon is for someone who’s level 35, in a group with other people of the same level, and are not familiar with the dungeon already. The lack of traits really hurts more than I had expected it to, and having done it again on my guardian about 10 levels higher, it was already significantly easier. I have a small quibble in that the runes you get as drops in explorables are soulbound (they really should be account bound, I think)…runes of the monk are basically useless for my Mesmer, but they would be great for my Guardian. Still, they’re cheap with tokens, so it’s not a huge deal…just a really minor annoyance. Still, I do enjoy them. We’ve got AC and TA story down to a science, as well as AC explorable path 2. And while the rewards for the explorables will take time to get…they are worth it. Earlier today I completed the final AC explorable run I needed to get to 390 tokens, and I bought my mesmer the ghostly greatsword. I fell in love with it because of how it looked in the previews…but at night when it glows? It looks so amazingly awesome. Screw the legendary greatswords, this baby is all I will ever need! I may have to get an AC weapon for my guardian as well. Hammer or mace, most likely. I also need some more CM runs for the runes of the noble (sad that the merchant is bugged and where there should be major runes offered, there’s just a second minor rune listed but priced at 30 tokens, which is what a major is), as well as something like 40 Twilight Arbor explorable runs so I can get armor and weapons from there for both my mesmer and guardian.